Australia’s hardest hitting Hammond Organ trio Cookin’ On 3 Burners are cracking the lid on their latest dance jam “Warning”, a crispy, feel-good number with killer vocals and fierce rhymes by rising soul talent Kaiit. The time travellin’ purveyors of mid-60s soul, 70s funk and dirty breaks have been conquering the world with their infectious grooves for over two decades now and like a matured fine wine, their rich oaky tones have hit prime intensity. 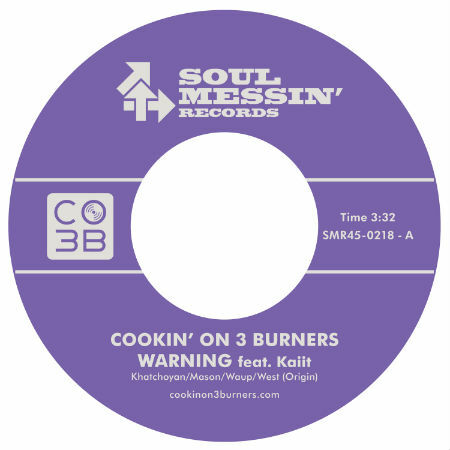 Slated for release on Friday August 10th, “Warning” is the first single to come from Cookin’ On 3 Burners’ forthcoming full-length “Lab Experiments Vol. 2″, the sequel to 2017’s “Lab Experiments Vol. 1: Mixin“. The track will be released digitally and on freshly pressed double-sider 45, with frenetic funky instrumental “The Jump Off “ on the flip giving a nod in the direction of all b-boys and b-girls. An immediate dance floor filler, “Warning” is a collision of past, present and future; the collaboration of the CO3B’s signature deep funk and organ jazz and the inimitable style and honeyed rhymes of Kaiit who is currently pushing neo-soul to the forefront of Australian pop culture. Birthed from of a mutual respect and admiration of each other’s sets at The Get Down After Party for NAIDOC Week last year, plus a lasting friendship developed from the Dig Deep mentorship program, the co-written track is a funk-fueled exploration into the future sounds of yesterday.